Active since 1985, PATINA® originates from a very strong passion and attraction to those warm graceful lines and refined creativity in colors and decorations typical of the 18th century Venetian hand painted furniture. Certainly an originally oriental technique, that in the 18th century spread all over Europe, making precious the furnishings of the fine mansions of royalty and aristocrats of the time. 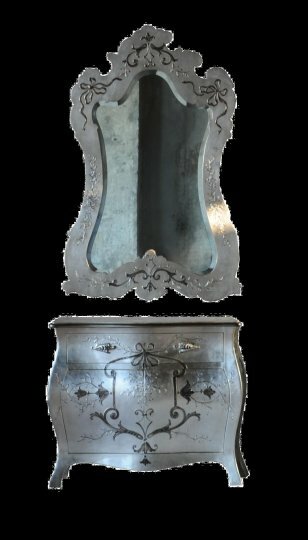 Most of our pieces are inspired to antiques discovered in museums, old furniture books and fine antique furniture shops; others are our own designs combining tradition with our own aesthetic touch and creativity. Our skills and uniqueness lay in the excellence of the decoration technique, thanks to which new raw wood becomes an authentic piece of art, astonishingly beautiful and with an antique flavor. Many of our customers describe Patina furniture as dreamful objects, poetry masterpieces one should be capable to properly read and interpret. Countering the ever growing simplism and aesthetic minimalism that almost obliterates colors, Patina offers exclusive pieces unique and with a high intrinsic value – warm furniture with polychrome decorations, perfectly balanced. Thanks to the variety of our color and decoration options, and to the creativity, imagination and taste of our customers, each piece can be produced in a never ending combination of colors, decorations and finishes – thus making this extreme customization of each item a fundamental characteristic of Patina collections. Patina can make any changes to its standard products and, should our many creative options be not enough, we can decorate according to colors and decorations as specified by each customer. Our quest for new shapes, colors and decorations makes Patina collections ever fresh and appealing. Revisiting tradition through contemporary lines, colors and designs, results in collections apt to fit also modern style homes, with a touch of warm elegance. The Patina stunning product line can be seen, today, throughout the world in private residences of personalities of the worlds of arts, fashion, show-business and politics, as well as in prestigious hotels and offices.